(THE CONVERSATION) Editor’s note: A total solar eclipse will be visible across the U.S. on Monday, August 21. Shannon Schmoll, director of the Abrams Planetarium at Michigan State University, explains why and how it happens, and what we can learn from an eclipse. A solar eclipse happens, on average, a couple times a year. The moon passes between the Earth and sun every 29 days, a time we call the “new moon” – when the moon is not visible in Earth’s nighttime sky. However, the moon’s orbit and the sun’s path in our sky don’t match up exactly, so at most of those new moon events, the moon appears above or below the sun. Twice a year, though, there is a period where the moon and the sun line up with Earth – astronomers call this an eclipse season. It lasts about 34 days, long enough for the moon to complete a full orbit (and then some) of the Earth. During each eclipse season, there are at least two eclipses visible from some parts of the Earth. At the full moon, there will be a lunar eclipse, when the moon passes directly behind the Earth, resulting in a darker, reddish-colored moon. And at the new moon, there will be a solar eclipse, when the sun is blocked by the moon. We can definitely learn things from eclipses. The outermost layer of the sun, known as the corona, is difficult to study because it’s less bright than the rest of the sun – so we have trouble seeing it amid the rest of the sun’s brightness. When the moon blocks the sun, we can see the corona, the famous visual of the halo of light around the dark disk of the moon. Currently astronomers study this by creating an artificial eclipse with a mask built into special instruments on telescopes called coronagraphs. This is great, but doesn’t allow the best pictures. 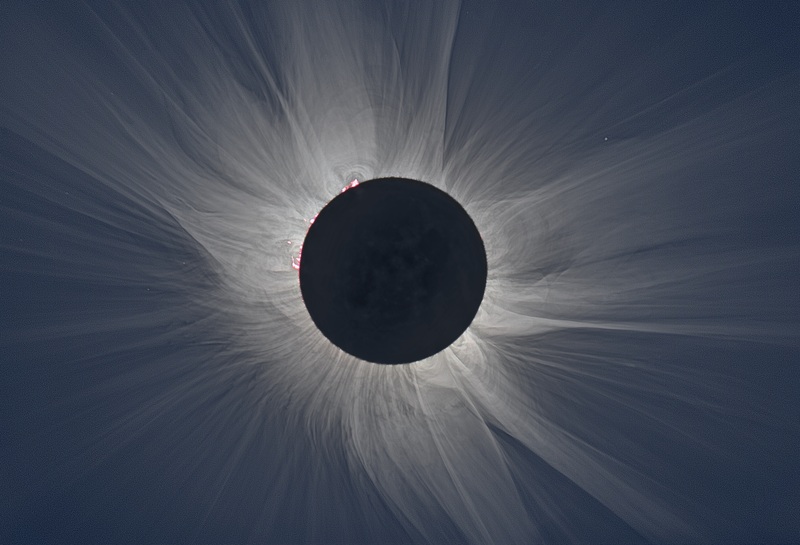 Eclipses give scientists opportunities to get more data to study the corona in depth. Sir Arthur Eddington, an astronomer who helped further the study of general relativity and whose work is a major piece of our modern understanding of stars and black holes, used the darkness provided by a solar eclipse to look at the position of the stars’ light during the day, when it passed the sun. He then compared those positions to their known positions at night. He saw that the gravity of the sun had bent the path– exactly as, and in the precise amount that, Einstein had predicted. It is very unusual that the moon and the sun just happen to be at the right distances and sizes to appear to have the same size in our sky. This allows the moon to perfectly block the sun’s disk, while also showing us the corona. Venus and Mercury, for instance, can also pass in front of the sun from our perspective. However, they appear as small specks moving across the sun. If you were on the moon, you would be able to see the effects of the solar eclipse on Earth only if you were standing on the moon’s night side, the side facing the Earth. You would see a round shadow cast onto the Earth. This particular eclipse will first hit the Pacific Ocean, then move into Oregon, cross the U.S. to South Carolina and end in the Atlantic Ocean. This path the shadow takes is called the path of totality. This article was originally published on The Conversation. Read the original article here: http://theconversation.com/when-the-sun-goes-dark-5-questions-answered-about-the-solar-eclipse-81308.